Gotta love a bonus toy! And we were just playing with remote control toys today! 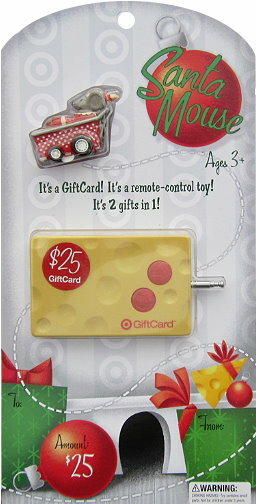 I love all the great designs of giftcards. Thanks for the giveaway! What a cool card! Happy holidays! I would like to win!!! Love this site! I refer to it all the time before planning to go to Target! Love it! Would love to win. These gift card giveaways are great. I like on FB n Twitter. I love your site! Thanks for the Elmo deal! I would love to win this give away!!! This is soo cool. This site is the best. I like Totally Target on facebooked. omgosh! this gift card is awesome! Thank you for an early christmas present! I really want to win one of these! I would really love to win this giftcard! It looks so fun!!! !